Ahh…the joy of retirement days! The stress-free life when you can wake up whenever you body clock wakes you, no more deadlines to meet and emails to follow up. The only daily struggle you have should be….what to do today? Bali has been a destination of choice for middle-aged couples spending their retirement days; generally those who have been living all their lives hustling in big cities, in cold winter days. How can you say no to this exotic island with a tropical weather, a laid back lifestyle, and a reasonable living cost? When talking about Bali as a retirement holiday destination, Ubud often becomes the preferred suburb for the seniors wanting an “easy life” during their holiday. This is due to its serene ambiance, peaceful environment and the fresh air, being located up north in the mountain area. If you’re new to this neighbourhood, or still organising your trip to Bali, we hope that you will find these tips and information useful. Now that you have all the time in the world, why don’t you learn new things you’ve been dying to try since…forever? Bali is extremely rich in cultures. Learn Bahasa Indonesia, or Balinese, practice Balinese traditional dances (that are good for your posture, by the way!) or if you’re into arts, you can pick among so many painting classes in Ubud that vary from conventional, contemporary, to modern arts. You can also sharpen your skills in product design by joining silver smith classes! How exciting does that sound! Chez Monique Jewelry is one of the jewelry shops and workshops that have gotten excellent reviews on Trip Advisor. With the help of their experienced silver smiths, you get to craft your own jewelries and create a lasting holiday treasure. While in some places, like I Nyoman Warta, you can learn how Batik is made and try painting some of your own! Just because you no longer work on a daily basis, doesn’t mean you stop moving – especially when being active is in your blood, and you can’t stand not doing anything. In our resort alone, there are plenty of exciting activities such as agro forestry, where you can take a walk around our garden where we grow some of the fruits, vegetables, and herbs we use in our restaurants and The Spa. A little bit outside the resort, which you can reach using our complimentary shuttle service, there is Campuhan Ridge Walk near the Ubud centre. Have a peaceful sunrise stroll here and top your beautiful morning with a nice set of breakfast from the local cafes close by. We believe that love never gets old, love grows stronger every time. 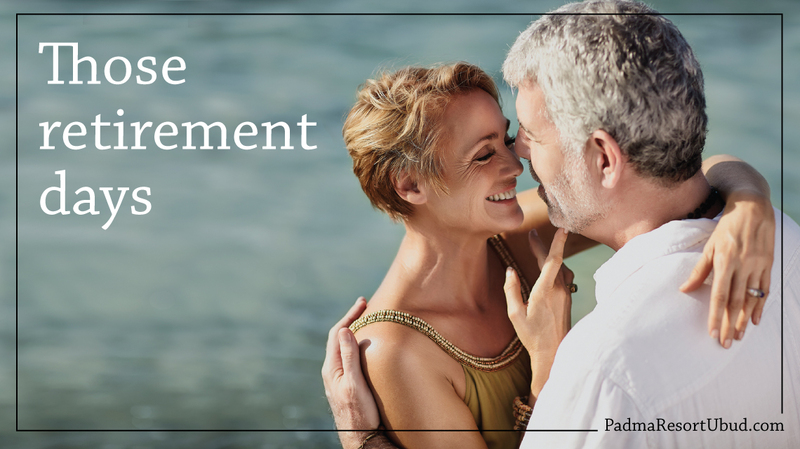 Now that you are responsibility-free (well, work-wise) isn’t it just the ideal time to make up for the time lost during the busy days to spend good quality time with your significant other? Ubud is not just the Mecca of yoga and healthy food, it is also the perfect spot for romantic activities. In Padma Resort Ubud, we offer two types of romantic dinner; in a private bamboo barn, or by the pool. Want to have your room decorated with a honeymoon set up? Yes, you can. Who says you can only go on a honeymoon once! 😉 The tranquil atmosphere and the stunning view will make almost anything you do together with the dearest at Padma Resort Ubud a romantic experience; be it an afternoon tea, a cycling trip, or an afternoon walk to the neighbouring village. If you’re thinking of going outside the box to “wow” your partner (and be prepared for some tears of joy), fly over the breathtaking views of Bali iconic spots with a private helicopter. Witness the truly amazing nature of Bali; hover over the Mount Batur crater or the rugged terrain of the Kintamani area with your other half. This will definitely check one box off of your bucket list and create an unforgettable moment you will cherish forever! How many kinds of Balinese coffee have you tried while in Bali? Doesn’t it taste like heaven when it touches deep into your soul from the very first sip? If you’re passionate about coffee and would like to learn to make your perfect cup of coffee, look for Seniman Coffee while you’re in Ubud Center. Heads up: if you’re driving, you will need to park your car in the market and walk to Seniman Coffee or if you have a driver with you, get him to drop you at the front of the alley where this café is located. You know you have reached Seniman Coffee when you see a laboratory-like bench as you walk in, and their iconic handmade rocking chairs! Now, to the coffee classes they offer. You can choose from brewing, roasting techniques, milk and latte art, and a lot more – coffee addict would be familiar with all these terms and procedures 😉 So, be a barista for the day. A wise man once said, it’s never too late to learn anything! It is said that as we grow older, we revert back to childhood and start acting like grown-kids. There’s definitely nothing wrong with that – who doesn’t love some fun and laughter anyway? Kids are all about never ending play time and adventures. How about we start the voyage to the pine forest in Kintamani, which is one of the top 11 Beautiful Pine Forests in Wonderful Indonesia. The main attraction of this site is no other than the magnificent view. Many would drive all the way from the city to Kintamani to take pre wedding photos or general holiday snaps, while many would come for a walk through the enchanted forest. Ok – now onto another fun spot. This one is quite a drive from Ubud. But it’s a holiday, you can explore to wherever your heart desires! 😉 This current sensation, “Air Terjun Cinta” (translated to the waterfall of love in Bahasa Indonesia) is located in Buleleng, approximately 2 hours drive from Ubud. 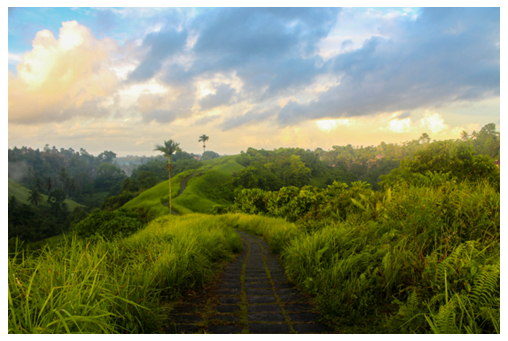 The view of the surroundings and local Balinese villages along the way will make the journey so worth it. With only IDR 20,000 entrance fee (less than USD2) you can explore the waterfall and take photos as a giant bird in human-sized bird nests. Bring out the inner kid in you, explore, and have fun! Another advantage of being in Bali is that there are a few islands nearby you can take a day trip to. Many would go on a cruise to party, or for a dinner in the middle of the sea at sunset. There’s one unique cruise that offers you an exceptional dining experience on a traditional pirate looking wooden ship. You will be accompanied by live music and exhilarating performances such as fire dance! This dinner cruise is also jam packed with fun games and activities – it’s not every day you get to experience a dinner like this isn’t it?